Would anyone really listen, to what my broken heart conceals. To rescue a beautiful dog called Ren, who'd no home and nothing to eat. Who someone had dumped with no mercy, were his owners really that blind? Ren roamed many days in the city, if only we knew where he'd been. We only know somebody dumped him, could that someone really be you? Why did someone take this poor creature, and just leave him somewhere to die? So why did his owner not love him? why did his owner not care? If only man were that faithful, when he were put to the test. If only he'd stop and remember, they hurt just like me and like you. He'll be taken for walks in the morning, and at night he'll be taken to bed. Then please call ROUGH COLLIE RESCUE, and at least give him somewhere to live. My mind so full of Fear. And was glad to see me go. Will find a brand new mum. A hand to stroke my head. I have to sit and wait. I'll guard and love and trust you, in everything you do. So all I ask for when I pray, is your love in return. Before you embark on this journey Please stop! step back and think twice. But please stop and look before leaping, is this really the right breed for you. 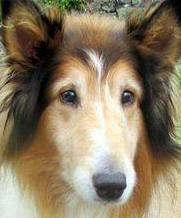 So if you take on a Rough Collie, please remember this dog is for life. She didn’t get much of a send-off, the old collie dog; Not a drum was heard, not a funeral note The old white van her hearse, laid in the back, tenderly enough, In an old blanket, which served her as a shroud; feathery tail drooping from one end, while from the other peeked that familiar long, pointed muzzle, the tip of a silky ear, and one of her soft, brown, limpid, liquid eyes now dulled in death. We drove her, each remembering, through sunny Warwickshire lanes To the practical place; the place where they attend to such things; a pretty place, for such grim business, set amongst apple trees. We carved not a line, and we raised not a stone Simply carried her in; laid her on a table; then a caress, a last goodbye, And we left her alone with her glory Both too choked up to speak. We’ll have her back, in a day or so, duly processed, Beth-in-a-box. But she won’t bark anymore when she hears the door She’ll chase Amie round the garden no more And every time I go to the van I’ll see her there. Goodbye, old friend, and thank you. We’ll miss you, Susie and Amie and I While we think of you, barking at the Pearly Gates, And nipping the ankles of the angels Whenever they sneeze. Mum tells me I should lay and rest, but I'm off out to play. Why does my mummy worry? They do not bother me! But I still have my playpen, wait till I am three! If I find something that's no use, I throw it in the bin! Some are dragged out to the lawn, until I’ve time to play! I didn't like the wall paper, I pulled it off the walls! And then I practice looking cute whenever mummy calls! It wasn't me it was the cat, that messed on all the floors. It wasn't me who taught the cat to open all the doors! The lawn looks like a bomb site, my life is one big hoot! "Tyler would you please behave, and leave my bed alone! What shall I do tomorrow, to amuse my old man? My paw prints are my autograph, who could ask for more? Mum rushes out to fetch it back, oh well, at least I try! I just wish he would slow down, so I can chew his boots! No one knows I steal her food, it seems I’m on a winner! Well how was I supposed to know the food was not for me? Make the most of everyday, I hope I make you laugh!! I GOT A PUPPY ON THE 14th February, 2014 !!! My name is Tyler Valentine and I’ve been here a year. It seems I am a cute puppy, who fills Mum’s heart with fear. I don’t know what the problem is, it does not bother me! to learn I’m very special, genetically modified. There are bits of me still missing, or not where they should be. I wish mum would not worry, it does not bother me. You want to see me strut my stuff when we wander round the town. Mum thought she would get chocolates, laid out in a box. Instead she got a puppy, who steals and eats her socks! Dad came down to shut me up, he came to show he cared. He scooped me up and cuddled me and carried me upstairs. But I had lots of things to do, so busy I could weep. I tore the paper off the walls, I chased poor Tammy cat. But when I cleaned the toilet, he was having none of that! why you humans go to bed, I have not got a clue. I want to go outside and play, listen to the birds. But everyone has gone to bed, you humans are absurd! I do not care what I do wrong, my life is one big hoot. To me it tastes like rubber so I left it for the cat. Dad fetched a brand new bed for me, that was a waste of time. Just let me sleep wherever, I promise I'll be fine. Who dug that hole into the wall? I swear it was not me! Who ate all the toilet rolls? Not guilty was my plea. Ok, Ok, I shredded them, Oh well, I can not see! Or maybe it was Buddy, trying to help the cat? My life is full of mischief, laughter, games and fun. And I intend to hang around, till all my jobs are done. So who needs chocolate, wine or flowers, when mummy has got me? but I am oh so flipping cute that everyone loves me!! So please enjoy your Valentines, despite all the above. The day I came to Brassington I filled mum’s life with LOVE! but my mum decided that name was not for me. I’m gentle as a lamb. I hope that she remembers that I love Dairylea! And if there’s ever any left I get some more for tea!. I know I should eat dog meat but have you tried that stuff? I’m sure if humans ate it they would soon feel very rough. I don’t eat doggy biscuits they are too hard for me. But I am really partial to biscuits dunked in tea. I know what’s on the menu today it's fresh roast ham. Three for mum and three for dad but only one for me. Maybe I have just misheard but I’m sure he just said diet!!!! Is diet meat or vegetable? Is that what is for tea. You two can have the diet but mum please feed Me.? My diet can’t be bad!! Did you ever wonder when you dumped me that day? Did you ever care, that I got labelled stray? the day you threw me on the streets, my heart sunk in dismay. Did you give me a second thought? Or wonder where I’d roamed? I landed in the dog pound, scared and all alone. My days were numbered seven, I had no place to go. I said I had a family, who did not want to know. Well I survived the dog pound, one of the lucky few. I found a lovely safe warm home, all no thanks to you. I joined a group, oh so elite, it’s called The chosen few! I had a lovely nice warm bed, with lots and lots of toys. We learned to trust each other and I was mummy’s boy. I finally got the kind of home I always had deserved. Do you ever think of me and wonder how I am? I do not bare you malice, I just don’t give a damn. Did you throw me on the streets knowing I was blind? Thank god everyone’s not like you, uncaring & unkind. I lived the life of Riley, for 3 perfect years. I gained a sister, also blind. I took care of all her fears. You see I am a softee, a heart made of pure gold. My heart is huge and full of love, unlike yours, ice cold. I know that mum will treasure her, that’s coz my mum is kind. Everyone who met me loved me very much. All I ever asked of you was love. A gentle touch. From Rainbow Bridge I cast my eyes and keep them both on you. And just remember when I’m gone, we are the chosen few !! no more games, no more play. in a light oak box, duly engraved.